A half-plate daguerreotype from the John Hightower collection pictures a navy midshipman with friend or family, circa 1852-1854. The editor informs readers about an effort to erect an equestrian monument to Gen. James Longstreet at Gettysburg. The letters to the editor includes praise (and a humorous note) about the cover image of the last issue, and a request for help from a new subscriber to identify two portraits. 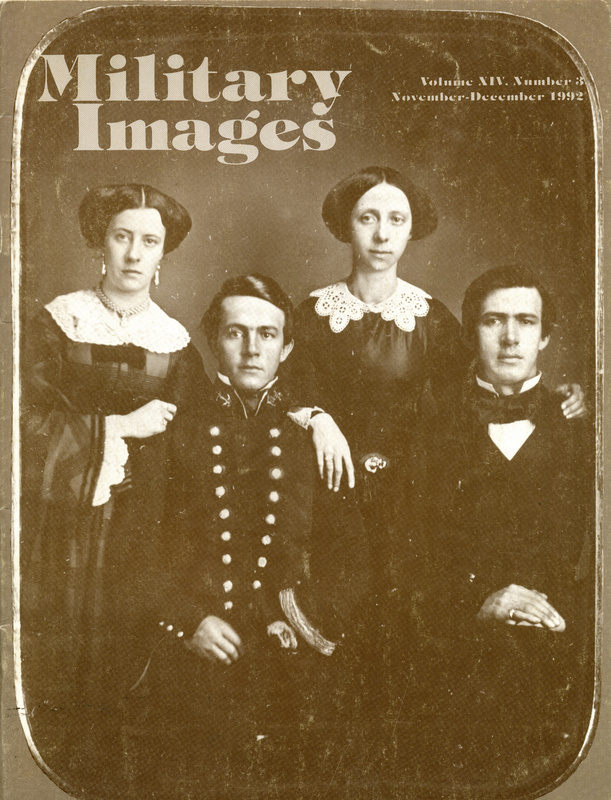 Five publications are mentioned, including Fighting for the Confederacy: The Personal recollections of General Edward Porter Alexander (The University of North Carolina Press), American Victorian Costume in Early Photographs (Dover Books) by Priscilla Harris Dalrymple, Guns of the Wild West (Sterling) by George Markham, Still More Confederate Faces: A Photographic Collection of Southern Soldiers from the Civil War (Metropolitan Co.) by D.A. Serrano and States Rights Gist: A South Carolina General of the Civil War (White Mane Press) by Walter Brian Cisco. A survey of 14 images of soldiers brandishing a variety of knives is accompanied by a brief and descriptive narrative. The 1st New Jersey Brigade, commanded by the colorful and eccentric Brig. Gen. Philip Kearny, distinguished itself during the Peninsula Campaign. The detailed narrative is illustrated with portraits of Kearny, Brig. Gen. George Taylor, Lt. Col. Robert McAllister of the 1st Infantry, Col. James Simpson of the 4th Infantry, 1st Lt. E. Burd Grubb of the 3rd Infantry, Sgt. Henry Callan of the 2nd Infantry, Capt. Franklin Knight of the 3rd Infantry, Col. Isaac Tucker of the 2nd Infantry, Maj. Henry Ryerson of the 2nd Infantry, Capt. Penrose Buckley of the 3rd Infantry, Capt. James Danforth Jr. of the 2nd Infantry, Maj. David Hatfield of the 1st Infantry and Lt. Thomas Howell of the 3rd Infantry. A biography of the prominent Vermont photographer is illustrated with three wartime images and an 1862 newspaper advertisement. A survey of 21 images of soldiers who served in European armies reveals commonalities in their uniforms compared to their American counterparts. Text that accompanies these images explains how a number of these portraits are now showing up in the collector’s marketplace and being passed off as Union and Confederate soldiers. A circa 1875 portrait of Payne illustrates a biographical sketch of the pioneer settler who served in the 260-man Illinois battalion commanded by Isaiah Stillman. Images of the monument dedicated to Illinois volunteers and a Payne-related affidavit are also included. In “The First Light Infantry of Providence, Rhode Island,” McAfee examines the regiment and its distinctive uniforms. The text is illustrated by two soldiers, cutout from a circa 1860 group portrait that is not shown. Three antebellum images from the collection of John Hightower include a Massachusetts militiaman wearing the belt plate of the Charlestown City Guard.